Forthcoming edited book from Routledge Studies in Renaissance and Early Modern Worlds of Knowledge. 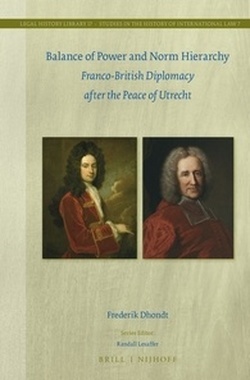 Frederik Dhondt, Balance of Power and Norm Hierarchy: Franco-British Diplomacy after the Peace of Utrecht (2015) offers a detailed study of French and British diplomacy in the age of ‘Walpole and Fleury’. After Louis XIV’s decease, European international relations were dominated by the collaboration between James Stanhope and Guillaume Dubois. Their alliance focused on the amendment and enlargement of the peace treaties of Utrecht, Rastatt and Baden. In-depth analysis of vast archival material uncovers the practical legal arguments used between Hampton Court and Versailles. ‘Balance of Power’ or ‘Tranquillity of Europe’ were in fact metaphors for the predominance of treaty law even over the most fundamental municipal norms. An implacable logic of norm hierarchy allowed to consolidate peace in Europe. This book explores the secret relations between theatre and diplomacy from the Tudors to the Treaty of Westphalia. It offers an original insight into the art of diplomacy in the period 1580-1655 through the prism of literature, theatre and material history. Contributors [several of whom are Network members] investigate English, Italian and German plays of Renaissance theoretical texts on diplomacy, lifting the veil on the intimate relations between ambassadors and the artistic world and on theatre as an unexpected instrument of 'soft power'. The volume offers new approaches to understanding Early Modern diplomacy, which was a source of inspiration for Renaissance drama for Shakespeare and his European contemporaries, and contributed to fashion the aesthetic and the political ideas and practice of the Renaissance.